Tiger Woods is not driving it as far as he could during tournaments for a reason. In his prime, watching Tiger Woods’ hit a golf ball was unlike anything else in the sport. He could unleash his power at just the right time, and smash the ball incredible distances. Whether he was pounding his driver down the fairway, or hitting the two iron ‘stinger’ for control, the power that Tiger exhibited was truly something to behold. Physical fitness. Tiger has long been one of the most impressive athletes on the PGA Tour, and that physique has helped him to consistently be near the top of the Tour in swing speed and distance. If you didn’t know what sport Tiger played, you could just as easily confuse him for a basketball or football player thanks to his size and build. Technique. No golfer can get by on sheer muscle alone. Golf is a technique-driven game, and Tiger has some of the best mechanics in the game. You don’t win as many titles as he has without knowing how to put the club consistently on the back of the ball, and Tiger has done it about as well as anyone in history. Confidence. This is an underrated element of swing speed and power on the golf course. When Tiger hits a shot, he does so with complete confidence that the ball is going to go where he wants it to go. For the average amateur, that confidence is lacking and it can show up in the way of lower swing speed through the hitting zone. By staying confident, the club is free to accelerate through the ball with no hesitation. 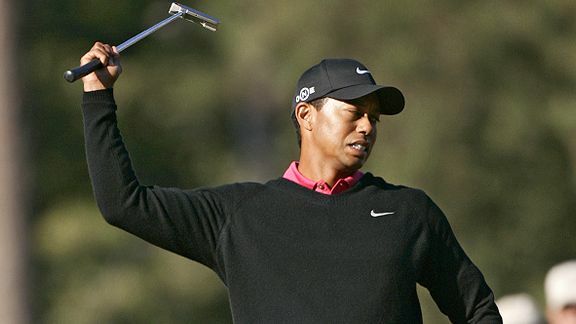 In the 2013 season, Tiger Woods’ swing speed on the PGA Tour was officially an average of 118.30 miles per hour. His highest individual measurement came in at 121.51, with the lowest at 115.13. It is important to remember, however, that there is a good chance Tiger Woods’ swing speed can be much faster through whenever he wants to. While playing on Tour, Tiger is more concerned with the outcome on the scorecard than impressing with high swing speed numbers. He is probably not going full out on every swing, and that is reflected in these stats. It is interesting to see how these numbers have changed over time. Looking back to 2007, the first year the PGA Tour kept swing speed numbers, Tiger Woods’ swing speed could be found on top of the leaderboard. That year, his average was 122.99, above long hitters like John Daly and Bubba Watson. His fastest swing was measured at an incredible 127.08, and the slowest at 114.76. Clearly, Tiger’s swing has slowed over the last few seasons. Is this a sign that Tiger Woods’ swing speed is not as fast as it once was? Not necessarily. There is a good chance that the slowing of Tiger Woods’ swing speed numbers has as much to do with strategy and decision making than it does with losing power. The competition on the PGA Tour has never been stiffer, and keeping the ball on the short grass is crucial to making birdies and winning tournaments. It doesn’t do Tiger any good to play from the rough in an effort to hit is as far as he can, and he surely knows that. By exercising some control over his swing, and losing a few MPH’s as a result, Tiger is likely making a conscious decision to optimize his game. At the end of the day, there is only one thing that pays the bills on Tour – low scores. Bombing it off the tee is great fun, but they don’t give trophies to the guys with the longest drives. Tiger Woods remains one of the most powerful golfers in the game, and despite dropping a few miles per hour in the stats over the last few years, can still bomb the ball out there with the best of them.